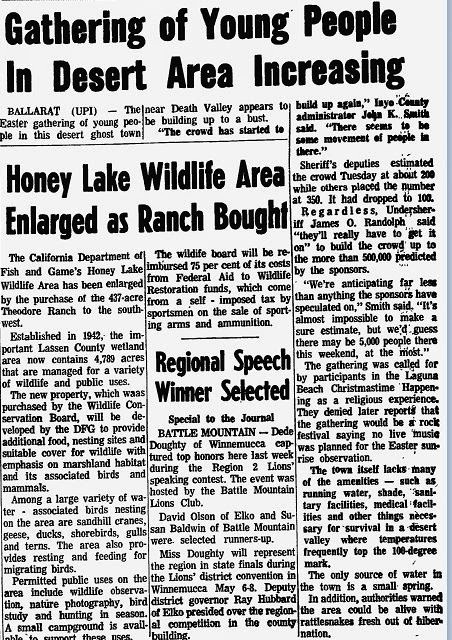 From the Nevada State Journal, April 8 1971: "the gathering was called for by participants in the Laguna Beach Christmastime Happening as a religious experience. They denied later reports that the gathering would be a rock festival saying no live music was planned for the Easter sunrise observation." *Special thanks to Michael Channels for permission to use the image at left. "According to Superintendent Murphy of Death Valley National Monument, no arrangements have been made with his department for the festival...As we see it, this festival has all the makings of a very bad trip." Promoters jumped on board and rumors floated that bands like Jethro Tull would be in attendance. BEL member Dion Wright who painted the Taxonomic Mandala made the following statement: "An Easter gathering will take place in Ballarat California, an eighty acre privately owned ghost town...(that) has been offered free of charge. We have represented to (Inyo County) a pilgrimage...including the placing of a Book of Life in the Panamint Valley." Book of Life, not Book of Death (as in Leary's and the Manson's manifestos). Patty has heard the Goler Wash referred to as the "Holy Goler" and has always wondered why: perhaps this is part of the answer. Interesting, no? What is most interesting to Patty is that over and over, we see that the Family was part of a larger movement. The Family may have been fringe, but they did not exist in a vacuum. It seems like maybe this festival had something to do with the BEL's guilt, remorse, and a need for absolution from what went terribly wrong in their operation. Interesting that they'd choose Ballarat - the gate to Goler Wash and Barker Ranch. Any word on how it turned out??? Assignment noted and accepted. you will notice that about 350 showed up at the time of the report, and they were expecting 5000. Patty wonders where the Book of Life is and who signed it? If wikipedia is to be believed, 2,000 showed up and 200 got Hep A from contaminated drinking water. Ugh. I've heard that people used to drink beer because it was safer than water. I guess that sometimes still applies. What a trip. The one and only time I've looked up Ballarat on Wikipedia was this morning before I read this post. how weird is that, Doc?! YES - a can of BEER is safer than tap water and a can of beer a day will help keep the doctor away, BUT knowledgeable doctors are forbidden to prescribe such a medicinal liquid. Instead they must ONLY prescribe a recognized "blood thinner," in pill form manufactured by an FDA approved pharmacutical company. The only exception is: Under Obamacare, generic pills manufactured in places like India, and third world countries are approved for those who can't afford to buy "brand" medicine. In which case, a can of BEER is more safe than a generic pill. Oooh, the REAL truth !!! Heard the latest craze ? Rich folks are holding private parties where "knowledgeable" speakers - concerning a specific subject - are invited to discuss their understanding of an event, case, experience, etc. It's kinda like a famous singer being paid $$$$ to perform at a special birthday party. This post has been slower than Patty would have liked it to be. Matt suggested that Patty needs to recap who the BEL is and why they may be significant. anyone? Yes that's a good point Patty. I've had to ask a few times to be reminded of what BEL stands for.